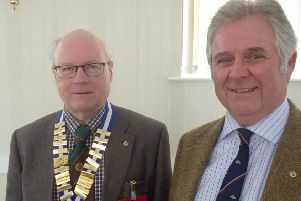 (left) Councillor Andy Burton, portfolio holder for planning, highways and transportation, with assistant principal engineer Alistair Martin at Shiptonthorpe. Work on a £260,000 shared footway and cycleway between Shiptonthorpe and Market Weighton is about to get underway. The existing footway between Town Street in Shiptonthorpe and Elm Tree on York Road, Market Weighton, will be widened by East Riding Council to create a shared footway and cycleway that will be two metres wide. The works are scheduled to start on 1 September, and are due to take 10 weeks to complete. The council’s Streetscene team will be carrying out the works. In order to minimise disruption to traffic along the A1079 during construction, two-way traffic flow will be maintained between 6am and 7pm. Between 7pm and 11pm, temporary traffic lights will be in operation as and when required. In addition, a temporary 30mph speed limit will be introduced between the Shiptonthorpe roundabout and the York Road junction to Market Weighton.